Getting important information out to all staff within a hospital can be challenging. That’s what we faced at Overton Brooks Veterans Administration Medical Center (OBVAMC) in Shreveport, Louisiana, as we strived to improve patient safety using The Joint Commission National Patient Safety Goals (NPSGs). Through our efforts to continuously improve quality, a core team of frontline intensive care unit (ICU) nurses recognized the opportunity to improve compliance with the NPSGs throughout the facility. failure to ensure that all staff members receive the information about the NPSGs. As the team leader, I facilitated meetings with a team of ICU nurses to explore strategies to effectively present the NPSGs hospital-wide. We looked for ways to present the NPSGs creatively, to include the staff working evenings and nights, and to make the presentation employee friendly. 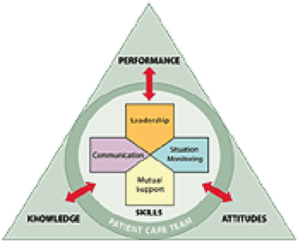 TeamSTEPPS is an evidence-based teamwork system designed to achieve the best clinical outcomes for patients by improving communication and strengthening teamwork skills among healthcare professionals. It optimizes the use of information, people, and resources. The core team recognized that TeamSTEPPS provided an opportunity to improve patient safety, assess the hospital’s safety culture, analyze survey results, and develop a targeted action plan. We made sure to incorporate the three key elements of TeamSTEPPS—performance, knowledge, and attitudes—into our plans for communicating and implementing the NPSGs. Source: TeamSTEPPS, from the Agency for Healthcare Research and Quality. Used with permission. Our first “step” was to plan a hospital-wide NPSGs Fair. We researched the elements of performance for each NPSG, reviewed hospital policies, designed display boards for each goal, and included photos of ICU staff for illustrations. We announced the fair via email, word of mouth, and postings throughout the hospital. In October, an autumn-themed “Fall for Patient Safety” fair, which included decorations of scarecrows, leaves, and pumpkins, was presented. Dressed alike in orange t-shirts, the ICU team was on hand to present the NPSGs, answer questions, and trick or treat the participants with candy and hourly door prizes. To remind staff about the event, the telephone operators made frequent announcements over the facilities intercom system. The fair extended awareness of the NPSGs to more than 150 employees from various departments throughout the hospital. A survey was conducted before and after the fair that documented a 54% increase in staff knowledge of the NPSGs. As a result of this significant improvement, leadership supported extending the project to include a poster campaign, a Veteran initiative, and a second fair. As part of our “OBVAMC Meeting the NPSGs” campaign, posters illustrating the NPSGs and their action plans were created and displayed in all patient care areas as a reference for staff. t-shirts were available to provide one-on-one NPSG information to patients and their families. “OBVAMC Speaks NPSGs to Our Veterans” posters were created and displayed in all patient care areas to increase patient and family awareness. These activities coincided with our hospital’s roll out of the patient-centered care initiative. By providing Veterans with this information, they were empowered to be actively involved in their care. To increase awareness and involvement with staff working the off shifts, we presented the second fair as a mobile presentation with a 24-hour display. This Mardi Gras-themed “Let the Good Times Roll for Patient Safety” fair was accentuated with beaded necklaces, masks, and moon pies. As we traveled from unit to unit presenting the NPSGs, we adorned each participant’s shirt with a “I Let the Good Times Roll for Patient Safety” sticker. The good times rolled on into ICU, where the ICU team had a festive Louisiana-style luncheon that served up red beans and rice, king cake, and jambalaya. Working on this TeamSTEPPS project provided an opportunity to learn how to navigate through the OBVAMC system to initiate change. This process facilitated learning the importance of interdisciplinary collaboration when implementing a project. Although we encountered many delays as we waited for other departments to complete assigned tasks, we appreciated everyone’s hard work. Other lessons learned included learning how productive, effective, and creative a high-performing team can be and how frontline staff can be effective change agents. All this helped improve staff teamwork and morale as we learned together how to have fun while getting the job done. Most importantly, when staff integrates NPSGs into daily practice, patients receive high-quality care. The TeamSTEPPS project helped the hospital become more patient centered and encouraged patients to be more actively involved in their care. Including the patients not only improved patient outcomes; it also improved patient satisfaction. The TeamSTEPPS system can be applied to other projects designed to improve patient outcomes. We encourage others to learn more about this system at teamstepps.ahrq.gov. Wendall M. Wilson is a staff nurse in the ICU at Overton Brooks VA Medical Center in Shreveport, Louisiana.